Bridge between two regions: Felsaad Coast and Moesring Mountains. Across the Isild river. The Felsaad Coast is the snowy, northeastern region on the island of Solstheim. The region is bordered by the Isinfier Plains, Hirstaang Forest and the Moesring Mountains. Its western border is the Isild River, surrounding Skaal Village to the north, the Inner Sea to the east and Glenschul's Tomb to the south. The Felsaad Coast is home to the two largest Nord settlements in Solstheim: Skaal Village to the north and the Thirsk mead hall, east of Lake Fjalding. Visitors are welcome to Thirsk and the Chieftain provides free mead as well as beds for the weary traveler. Thirsk is home to one of the most skilled armorers in Solstheim, who offers to make very rare (and expensive) Snow Bear and Snow Wolf armor. Skaal Village is not as hospitable as the former, unless one has been chosen to live among the Skaal after completing a series of tests (see the Main Quest). The Felsaad Coast is home to various barrows, i.e. Glenschul's Tomb, Gyldenhul Barrow, and the Tombs of Skaalara. The Felsaad Coast also boasts some of the most famous caves on the island, like Frossel cave, the Lair of the Udyrfrykte and the Caves of Fjalding. Weather in and around the Felsaad Coast can be very adverse, as blizzards are fairly frequent and travel becomes relatively difficult. One can often only see a few meters, you are advised to seek shelter until the blizzard ends. Like the rest of Solstheim, the Felsaad Coast is home to various species of shrub, Belladonna, Holly and the Solstheim Pine tree that provides building materials, firewood, as well as an integral part of the Solstheim food chain. Fauna is very much the same as elsewhere around Solstheim. Tusked Bristlebacks, Plague Wolves, Plague Bears, Draugr, Bonewolves and Horkers all call the Felsaad Coast home. Humanoids include Fryse Hags, Reavers, Berserkers, Smugglers, Spriggans, and Rieklings. There are even reports of stray werewolves roaming or inhabiting caves. Those traveling in and around the Felsaad Coast should familiarize themselves with the various landmarks that can assist in reaching their destination. Lake Fjalding and Thirsk are situated in the southern part of the Felsaad Coast. 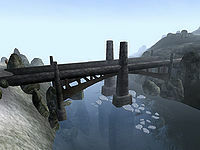 On the northern tip of the Felsaad Coast is a large Nordic stone bridge leading to the Skaal Village. West of the Tombs of Skaalara, close to Lake Fjalding, is the Beast Stone. Travel in and around the Felsaad Coast is mainly restricted to walking and swimming. Since there are no Tribunal Temples or Imperial Cult shrines in the region, the only magical transportation (or teleportation) is restricted to Mark and Recall spells. There are no ports that have been built (mainly due to the weather), there is no travel by boat either. Almost all of the Main Quest after The Disappearance of Captain Carius will take you to areas in and around the Felsaad Coast, mainly Skaal Village. A Woman Scorned: Avenge Kjolver's broken heart. The Mead Hall Massacre: Visit this mead hall and find out what happened to its patrons.